KJ Apa will play America's favorite teen in The CW's live-action "Riverdale" TV series, joining Ashleigh Murray as talented musician Josie McCoy. The news comes hot on the heels of other major casting news for the pilot, including the naming of Cole Sprouse (The Sweet Life of Zack and Cody) as Jughead Jones, Lili Reinhart (Surviving Jack) as Betty Cooper, and Luke Perry (Beverly Hills, 90210) as Fred Andrews. 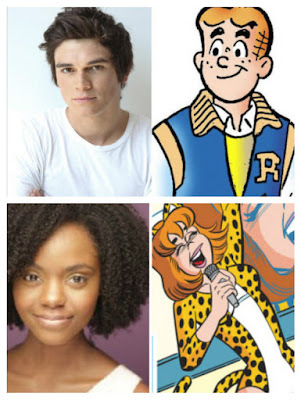 In the exclusive announcement, Deadline described Apa's Archie as "an intense, conflicted teen, a boyish high school sophomore who got pumped up over the summer working construction and is now juggling the interest of several girls, as well as trying to balance his passion for writing and performing music — against the wishes of his father and his football coach." Murray’s Josie is described as "a gorgeous, snooty and ambitious girl who is the lead singer for popular band Josie and the Pussycats. She has zero interest in recording any songs written by fellow teen Archie."